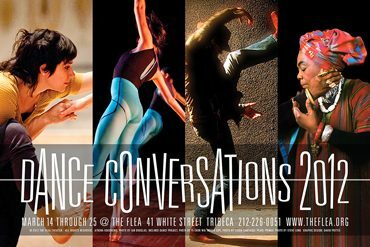 The Flea Theater is delighted to announce Dance Conversations 2012, a FREE festival continuing the spirited debate on dance and dancers. Click here for the Festival Program. NYC-based choreographer John Jasperse’s work has been presented by festivals and presenting organizations in the U.S. including The American Dance Festival, Durham, NC; Diverseworks, Houston, TX; The Flynn Center for the Performing Arts, Burlington, VT; Museum of Contemporary Arts, Chicago, IL; On the Boards, Seattle, WA; Philadelphia Live Arts, PA; Summer Stages, Concord, MA; the Walker Art Center, Minneapolis; the Wexner Center for the Arts, Columbus, OH; Yerba Buena Center for the Arts, San Francisco, CA; and internationally in Brazil, Chile, Israel, Japan, and throughout Europe including La Biennale di Venezia; Cannes International Dance Festival; Dance Umbrella, London; EuroKaz, Zagreb; Kampnagel, Hamburg; Montpellier Danse, Tanz im August, Berlin; TanzQuartier Wein, Künstlerhaus Mousonturm, Frankfurt; and the VEO Festival, Valencia. In New York, the Company has been presented at numerous venues including The Brooklyn Academy of Music’s Harvey Theater, Dance Theater Workshop, Danspace Project, The Joyce Theater, The Kitchen and Performance Space 122. Jasperse has also created works for other companies including the Baryshnikov Dance Foundation, the Batsheva Dance Company, and the Lyon Opéra Ballet. Awards and fellowships include the 2011 US Artist Brooks Hopkins Fellowship, as well as a NY Dance and Performance Award (a.k.a. BESSIE), a John Simon Guggenheim Memorial Fellowship, a TIDES Lambent Fellowship the National Endowment for the Arts (1992. 1994, 1995-96) and the New York Foundation for the Arts (1988, 1994, 2000, 2010). Wally Cardona has been recognized nationally and internationally for creating vast yet intimate works that use scale, setting and materials as integral partners in the creation of movement. Hailed as “one of the most adventurous choreographers of his generation, a master of passionate abstract dances” by Brooklyn Magazine, he is the recipient of a 2006 John Simon Guggenheim Memorial Foundation Fellowship in choreography and a 2006 New York Dance and Performance (“Bessie”) Award for the creation of Everywhere. He resides in Brooklyn, NY. He is currently teaching Creative Process at The Juilliard School and Performance/Phenomenon: Theory and Philosophy into Physical Practice at The New School University in New York City. Carol Ostrow joined Jim Simpson at the helm of The Flea in 2001 and The Guys marked her return to Off-Off-Broadway. She was the OBIE-award winning Producing Director of the Classic Stage Company, where she produced The Merchant of Venice, directed by Jim Simpson, the world premiere of Ezra Pound’s Elektra, directed by Carey Perloff as well as the acclaimed 30th anniversary production of Pinter’s The Birthday Party, among others. For The Flea, Carol has produced dozens of world premieres and has been responsible for sound fiscal management of the theater’s $1M budget for nearly ten years. In addition to expanding and professionalizing infrastructure at The Flea, she helped to develop the theater’s current 14- member board of directors and has overseen the launch of a patron program that has raised more than $150,000 in the past two years. She has produced the theater’s successful galas and has helped The Flea win prestigious grants from The Andrew W. Mellon Theater Program, The Lower Manhattan Development Corporation, The Empire State Development Corporation and The Shubert Foundation, among many others. Carol is a graduate of Vassar College and the Yale Drama School. She is a board member of LAVA, an acrobatic dance collective, serves on the President’s Advisory Council of Vassar College and the Board of Advisors of the Yale Drama School, and is one of the newest trustees to one of the oldest congregations in New York City, Central Synagogue. Married and the mother of four incredible young adults, she and her family count Pittsburgh, London, Montreal and now New York City once again as home. Jonah Bokaer is an international choreographer, media artist, and artist space developer. His work integrates choreography with digital media, resulting from cross-disciplinary collaborations with artists and architects. Bokaer’s choreography has been produced in Belgium, Canada, Cuba, Denmark, France, Germany, Greece, Holland, India, Spain, Switzerland, Thailand, the United Kingdom, and the United States. The development of his choreography in France has included major productions in Paris, Marseille, Lyon, and Avignon (FUSED, 2011), for which he was recently awarded the Prix Jeune Talent Chorégraphique by the SACD in Paris. Also in 2011, Bokaer received the Jerome Robbins special fellowship in Choreography of the Bogliasco Foundation, and was named one of “40 Under 40” by Crain’s NY Business. In 2008-2009 Bokaer became the first dance artist to be appointed a Young Leader of the French American Foundation. He led a group of choreographers in the formation of Chez Bushwick (2002). He later founded CPR – Center for Performance Research, a 4,000 square foot arts facility in Williamsburg, with John Jasperse (2008). Bokaer is a current choreographer for the operas of Robert Wilson. Such works include “FAUST” (Poland), “AIDA” (Italy), “KOOL” (USA/Japan), and “FRONTERAS” (Spain). For more information, please visit www.jonahbokaer.net. Curated by Nina Winthrop & Taimi Strehlow, Dance Conversations @ The Flea is a FREE film, performance & discussion festival.